A skilled, compassionate vet committed to pets—and their owners. Every animal has a story to tell and discovering those stories is what one of the things Dr. Oakes likes best about his job, a job he enjoys as much today as he did when he first opened the Diamond Lake Animal Hospital over 30 years ago. 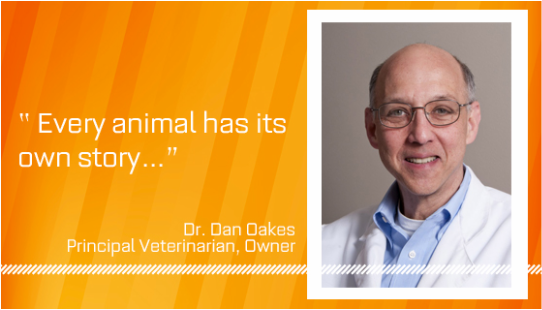 Dr. Oakes feels lucky to have spent his entire career pursuing his lifelong passion of caring for animals. Never far from Dr. Oakes’ side, both at home and at work is his dog Tucker. Dr. Oakes also has two stay-at-home cats, Jack and Maybe, a stray that he brought home one Labor Day weekend saying, “Maybe we’ll keep her, maybe we won’t.”, obviously they did. Dr. Oakes was raised in and has lived most of his life in Southwest Minneapolis. He earned his Bachelor of Science and Doctor of Veterinary Medicine degrees from the University of Minnesota, graduating in 1980. Eager to start his own practice, he opened Diamond Lake Animal Hospital in the spring of 1983. He has proudly served the fine pets of Minneapolis ever since. Dr. Oakes lives within minutes of the clinic with his wife Pat, a long-time Minneapolis public school teacher. They have three adult children: Krista, Kelsey and Jeff, who live in Minneapolis. All three are following the same paths of their parents. Krista taught school when her family lived in New York, Kelsey is a Minneapolis Public School teacher and Jeff is in the U of M Veterinary School. Dr. Mike Petersen loves animals, which is why it’s no surprise he became a veterinarian as a Minnesota graduate in 2012. From his first dog Zoe, a cocker spaniel who became his constant companion during middle school, to hundreds of pets of he cared for while working at Pet Smart as a student, Mike champions all pets, regardless of their shape or size. 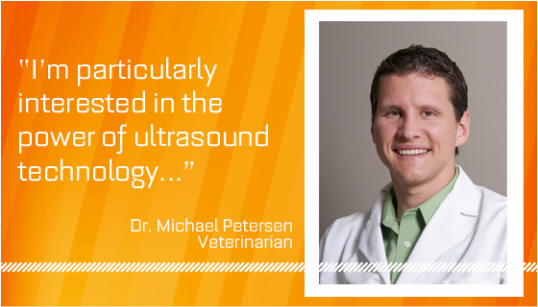 A 2012 graduate of the University of Minnesota College of Veterinary Medicine, Mike enjoys all facets of veterinary medicine, including the challenge of diagnosing tough-to-detect issues. “I’m particularly interested in the power of ultrasound technology, which allows us to see things that don’t normally show up on x-rays,” says Mike. Mike’s also enjoys working closely with owners to figure out what’s best for their pets, always keeping in mind both the best interests of both owner and animals. A lifelong dog and cat lover, Mike also enjoys exotic animals, especially reptiles, amphibians and pocket pets, cuddly little animals that, you guessed it, are small enough to fit in a shirt, pants or coat pocket. Mike shares his home in South St. Paul with his wife Erin, their young daughters Hazel and Ivy, three cats, a snake and a gecko. champion: His team Drag'n Thrust won the U.S. national title in 2013 and 2014 and the world title in 2014. Helena has been a CVT since 1991 and joined the Diamond Lake Animal Hospital Staff in 2011. She enjoys helping the veterinarians keep your pets healthy and happy and loves nursing our patients back to health and seeing them go home. She is a longtime resident of south Minneapolis with her husband, 2 kids, 2 cats and a dog Finnegan. When she is not at Diamond Lake Animal Hospital, she likes to spend her time with family and travel. Jason has been working in the veterinary industry since 2007 and recently relocated to the Twin Cities the summer of 2014. After helping a friend open and manage a brand new clinic in NYC, he decided it was time for a change of pace. He, his husband and their pets packed up and moved to Minneapolis. They love taking walks around the lakes. Prior to working with animals Jason had the opportunity of traveling the world as a professional dancer for Holland America Cruise Line. He was lucky enough to travel to 6 out of 7 continents over his 8 years of cruising. Jason loves meeting and greeting clients and most importantly, taking care of their pets.